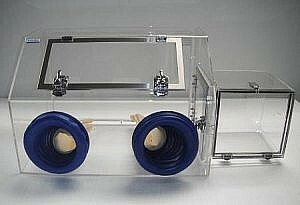 2200 Series isolation glove boxes, light weight, portable and space saving with 27” width. 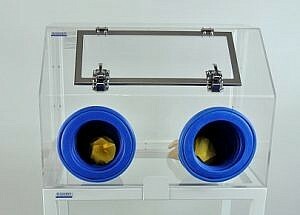 Cleatech portable gloveboxes come with front tilt-up window and optional airlock. These economical glove boxes have the same function as standard 2100 series with wide range of materials and accessories for humidity and oxygen control & monitoring. 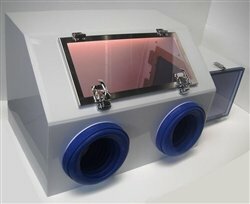 Prices shown below are not including the accessories and Airlock. Airlock Pass-through Transfer Chamber measures (ordered separately) minimize nitrogen loss and contamination inflow. Gas-in port & Pressure relief valve are required if using CDA, Nitrogen or any inner gas to reduce humidity. Pressure relief Valve provides safe pressure relief and helps to purge the moisture out the chamber. Single cord or Multi-cord Air-Tight Cord Grips, for cord diameter .08’’ to 1.25’’ Ideal for power cord data & internet cables, USB, monitor & printer connectors.